Tektronix VM 5000 HD Video Measurement Set with Opt 2M, DVD, VM, HD, SD. The VM5000 automates video testing of consumer HDTV and PC graphics devices such as digital set-top boxes, multi-media PCs, graphics cards, and video semiconductors. It addresses the needs of engineers developing and deploying the next generation of video devices for the digitally connected home. Unrivalled performance in terms of speed, accuracy, and reliability has made the VM5000 the choice of industry leaders for design validation, quality control, and ATE applications. Unlike conventional instruments, the VM5000 integrates acquisition hardware, optimized video measurement algorithms, test signal files, and accessories into a cohesive test system solution. Product verification activities that previously took hours or days to complete can now be completed in seconds or minutes. Offering near plug-and-play video measurement capability, even unskilled operators can reliably assess video output signal quality. The conformance of signals to specifications is reported with obvious pass or fail results, with signal distortions clearly identified for further analysis. The VM5000 stands alone as the only automatic video analyzer capable of supporting SD, HDTV and PC graphics signal formats. 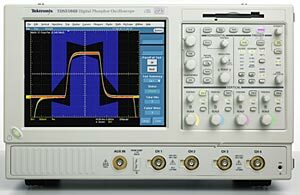 Offering a full 1 GHz bandwidth, and 5 GS/s sample rate, the VM5000 is well suited to the demands of measuring high resolution HDTV and high frequency PC graphics video signals. Traditional DTV formats from 480i through 1080i and either RGB or YPbPr color space are supported in Options SD and HD. Option VGA supports common analog RGBHV signal resolutions from 640x480p though 2048x1536p, and pervasive refresh rates from 50 Hz through 100 Hz. The ultimate solution for component analog video signal analysis, the VM5000 delivers comprehensive characterization of video fidelity, signal quality, and standards compliance. With available options, the instrument automatically assesses conformance of video signals to applicable EIA-770.x, SMPTE-274M, 296M, and VESA standards. Traditional ¿TV¿ signal fidelity is evaluated utilizing industry-accepted parameters, making 150 individual measurements automatically in less than 15 seconds. PC graphics signal fidelity is assessed via comprehensive RGB video and HV sync measurement parameters made in accordance with VSIS test procedures. Preloaded reference and limit files enable go-no go evaluation to applicable DMT, CVT, or GTF timing standards. As an integrated signal analyzer, the VM5000 can be reliably deployed as a stand-alone QA station in manufacturing. Unlike modular test systems, extensive programming, complicated system debugging, or costly test engineering support is not required with the VM5000. Integrated pass-fail limit testing and documentation utilities link distributed design, supply, and manufacturing organizations with standardized test capability. Product quality is enhanced because accurate test results can be reliably generated, easily replicated, and readily communicated across a global engineering, manufacturing, or sales organization. These unique capabilities enable in-depth signal analysis, speed product development, and ensure new designs comply with applicable standards. Fast, accurate, and objective video measurements enable manufacturers to ensure that HDTV or PC graphics video signal quality is up to the challenge of today¿s high performance displays, as well as providing clear differentiation between input signal and display device impairments.